With 3,000 miles of public rights of way to explore in Hampshire, and 173 recommended routes right across the county, we’ve got your next walk sorted, come rain or shine. We wanted to find some of Hampshire’s best walks, and who better to ask than those who spend their lives out in Hampshire’s countryside. We spoke to six countryside staff members about their favourite walks in Hampshire to help make your decision a bit easier. Julian Sheppard, one of our countryside rangers said, “The walk around Normandy Lagoon (at Lymington Keyhaven Nature Reserve) is one of my favourite walks because of the landscape, the views and you can also see a bit of the history. 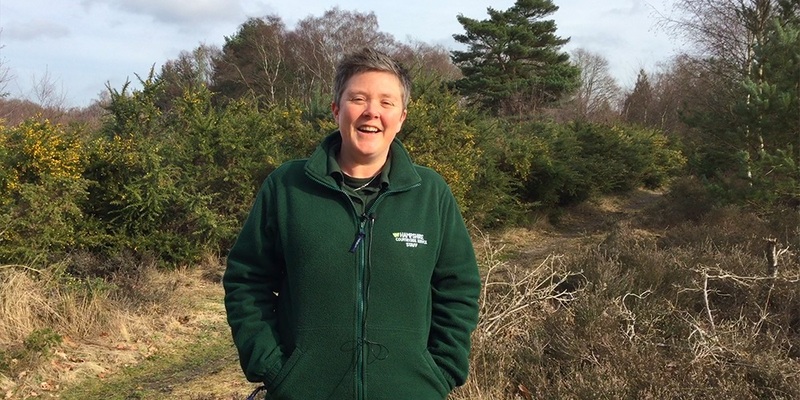 Jean Cheadle, one of our rangers at Yateley Common said, “I love walking around Yateley Common because of the variety of animals, plants and wildlife you get to see around here. Maybe you might be looking for a Sunday afternoon stroll with a few pubs on the way. Ashlea, our ranger at Queen Elizabeth Country Park said, “One of my favourite walks is the Staunton Way, there’s numerous little pubs you can stop at along the way. Or you might be an avid hiker, in which case Kate, who is one of our catering managers at Queen Elizabeth Country Park, recommends the South Downs Way. She said, “I really like long distance walking and one of my favourite walks in Hampshire is along the South Downs Way. If you’re looking for a walk along the coast, Adam, one of our Rangers at Lepe Country Park suggests the Lepe Loop. He said, “One of my favourite walks in this area is the Lepe Loop which heads from our new building here, partly down the coastline and loops round into our gorgeous countryside. With six country parks scattered across the county and a mixture of woodland, grassland, heathland and wetland, there’s something for everybody. Brisk walking at a pace that gets your heart pumping faster and makes you feel slightly out of breath can make a huge difference to your health. Over time it can help to lower the risk of serious illnesses like heart disease and type 2 diabetes, as well as improving mental wellbeing. For Hampshire residents who want to start walking, there are a number of free, short walks available every week as part of Walking for health. These are led by friendly, specially trained volunteers who are on hand to provide support and make sure no one gets left behind. Open to everyone, they are especially aimed at those who are least active or who have a long-term health condition. Find out about more walks across Hampshire on our website.